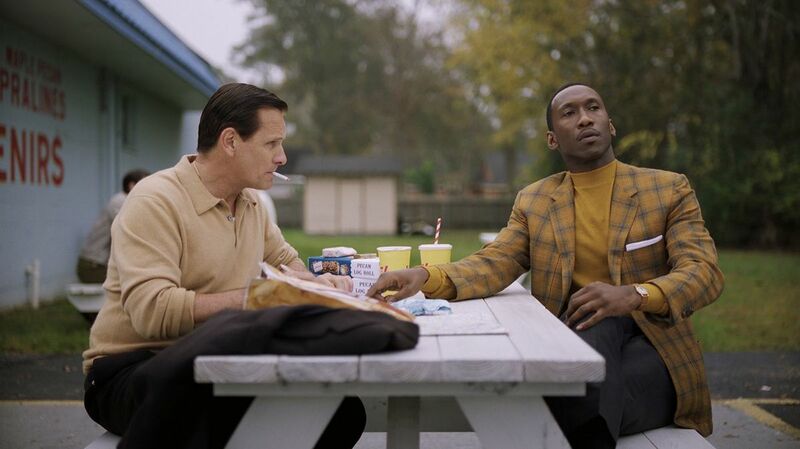 All bets are off for me: Green Book has my vote for the Best Film Oscar this year. 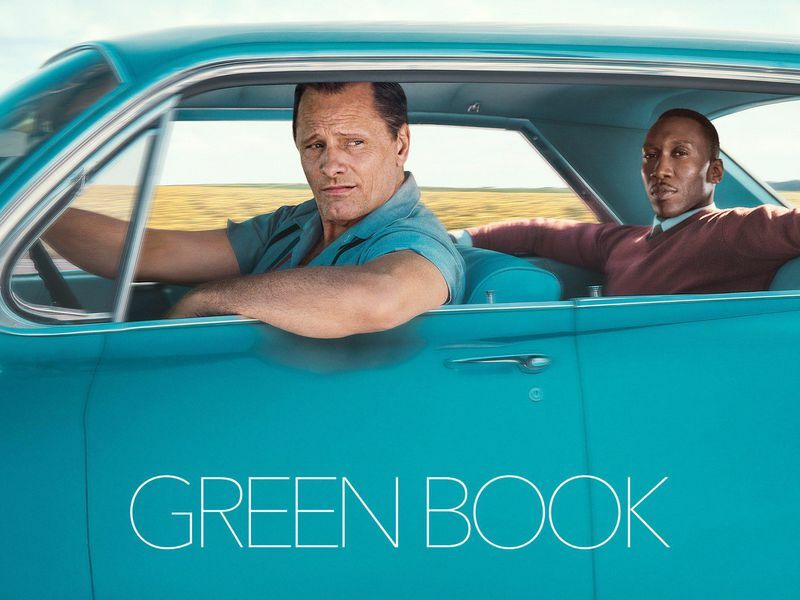 Like several of this year’s contenders – Mary Queen of Scots, The Favourite and Bohemian Rhapsody – Green Book is based on fact. A film based on a true story is not a documentary nor should be taken as such. A film creates an impressionist’s view of the characters and situation, and is a subjective viewpoint. It’s not necessarily the full picture or complete truth. This doesn’t lessen the impact or effect for me – instead it enhances it. 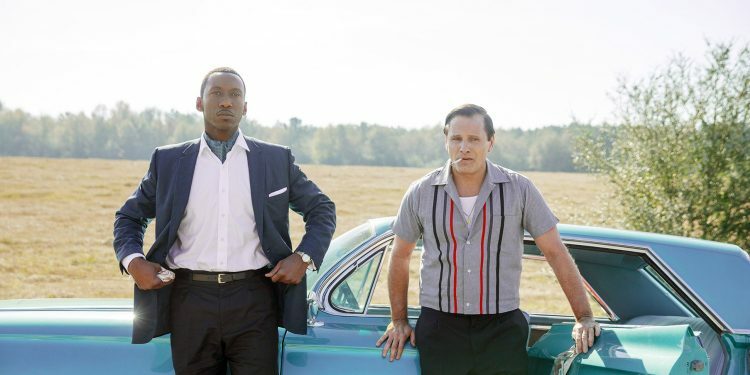 Green Book is based on the lives of virtuoso classical and jazz pianist Dr Don Shirley (Mahershala Ali) and his driver for his 1962 tour of America’s deep south – Italian-American bouncer Tony “Lip” Vallelonga (Viggo Mortensen). The picture is part odd couple, part driving Miss Daisy. It is a road trip movie where the development of characters and their relationship with each other progresses with the physical journey they are taking. The journey of the two men who, during the course of the film become friends, is told mostly in the Cadillac travelling through various states of the U.S. In 1962, segregation was still prevalent in the southern American states. Shirley is invited to perform for conservative white patrons in fancy hotels and homes but is not permitted to use the same entrances, facilities, or eat and stay in the same establishments. Realise this is just over 50 years ago – it is seen as a history of which it is even now is not completely banished as a relic of the distant past. Ali is sublime in this role. His performance is nuanced and understated, and he is transformed into the pianist Shirley, who, aged nine, was the first black pianist to be admitted to the Leningrad Conservatorium of Music. Shirley’s journey and struggle with the American prejudice of the time is similar to that experienced by fellow American Nat King Cole. While Cole is a more popular entertainer, Shirley feels his own classical training is less accepted by mainstream audiences. However, like Cole, Shirley believes in quietly chipping away at prejudice. “You never win with violence, you only win when you maintain your dignity,” Shirley tells Vallelonga. Mortensen as Vallelonga is street smart and understands how the world works. He is casually racist at the beginning of the film, before he starts travelling with Shirley he throws away two glasses in his home in which his wife served two black American handymen who had come to fix the sink. Vallelonga’s son Nick Vallelonga has a writing credit on the film and also plays a mobster. He says certain scenes in the film were particularly easy to write as they virtually wrote themselves from the stories his father had told him. Linda Cardellini as Dolores (Vallelonga’s wife) is so well cast that Nick says she made him cry. Her portrayal is very typical of the 60s Italian housewife very much in love with her husband and part of the extended family. Director Peter Farrelly is also listed as a writer, along with Brian Currie (Con-Air and Armageddon). This is a very unexpected film from Farrelly who, with his brother, was responsible for There’s Something About Mary; Me, Myself and Irene; Shallow Hal, and Dumb and Dumber. 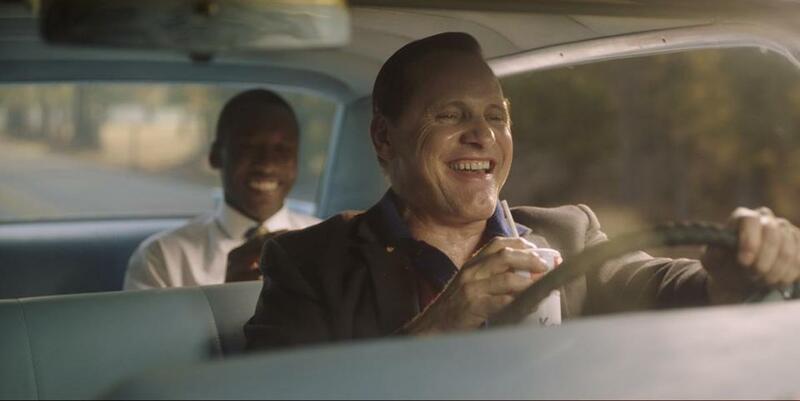 Green Book is such a departure from these inane comedies that it’s hard to believe it’s the same Peter Farrelly. In this he superbly directs two extraordinarily talented leads into giving powerhouse performances, develop a significant story, and deliver some clever one-liners to save it from any saccharine or trite moments. The humour provides relief from the serious issues of the film, and while messages of racism and prejudice are front of mind, the film’s underlying theme of relationships and changing perceptions ensure that the film is ultimately a positive and uplifting story. The one scene where Shirley cuts loose on a honky tonk piano in a roadhouse has a joyous tone of release. . There is a scene where the road trip is halted when they are pulled over by police. The two men find themselves in jail and with his one call, Shirley manages to get them freed through his relationship with the Attorney General. 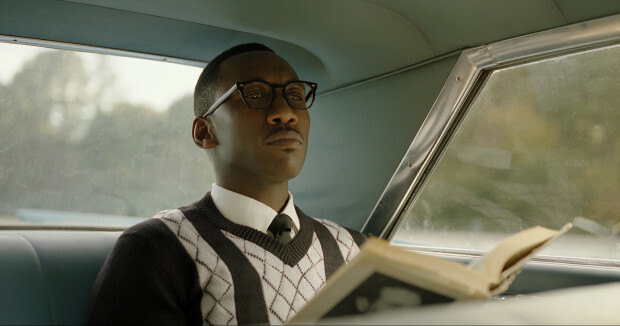 This shows that for some, racial barriers had broken down, however, Shirley was ashamed that he had to make the call and distract Bobby Kennedy from more important business regarding the fight against segregation in the south. The film focuses very much on the outward character of Shirley, his beliefs, his incredible intelligence, musical talent, elegance, and sense of right. There is also much we don’t learn about Shirley. He has a failed marriage behind him and a single scene shows that he is gay. This shows the enormous difficulties that he must have faced. Not only was he an artist of colour but he wasn’t the typical entertainer his audiences expected. Vallelonga at one point tells Shirley he is more black than him as Shirley is too rich to identify with other blacks, doesn’t eat fried chicken nor listen to the music of his people (he is surprised when he hears Little Richard on the radio). Yet, he is not white enough to stay in hotels in the south outside those in the Green Book. Shirley says: “So if I’m not black enough and if I’m not white enough, then tell me Tony, what am I?” He is between worlds and the world has a good deal of catching up to do. “Being genius is not enough, it takes courage to change people’s hearts,” Shirley says. That there is still prejudice in 2019 means this is a film that is still relevant and important today. The excellence of this film will hopefully ensure its longevity and the performances of both leads deserve recognition. 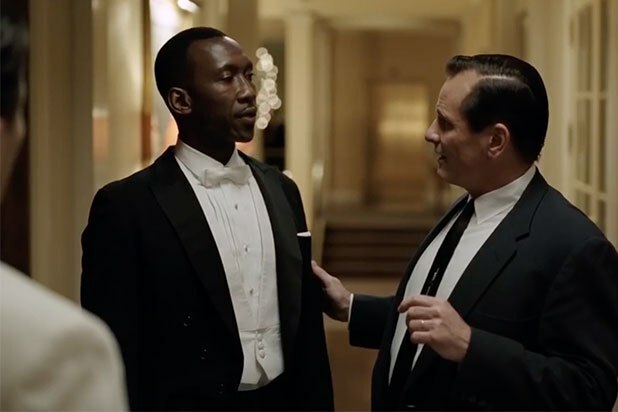 Already this season the film has won three Golden Globes – one for Best Motion Picture (Musical or Comedy), Best Performance by a Supporting Actor (Mahershala Ali) and Best Screenplay (Nick Vallelonga, Brian Hayes Currie and Peter Farrelly). The Oscars will be held on Monday February 25.